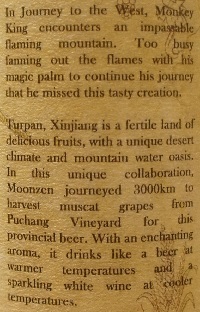 Brewer Description: (from bottle) In Journey to the West, Monkey King encounters an impassable flaming mountain. Too busy fanning out the flames with his magic palm to continue his journey that he missed this tasty creation. Turpan, Xinjiang is a fertile land of delicious fruits, with a unique desert climate and mountain water oasis. 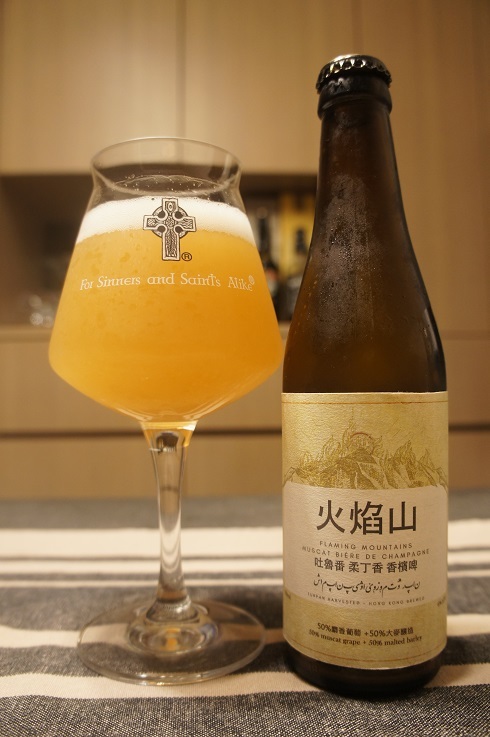 In this unique collaboration, Moonzen journeyed 3000km to harvest muscat grapes from Puchang Vineyard for this provincial beer. With an enchanting aroma, it drinks like a beer at warmer temperatures and a sparkling white wine at cooler temperatures. Intro: A 330ml bottle with no bottled on or best before date. Poured into a Lost Abbey teku glass. Appearance: A cloudy dark straw yellow colour with a one finger white head that dissipates slowly and settles to a thin layer while leaving only sparse lacing. Very lively with lots of bubbles throughout. Aroma: Nice citrusy lemon, lemon zest, white grape and light malt. Floral and perfume-y on the finish. Taste: Green grapes, vinous, white wine, grass and a touch of lemon. Like the aroma, finish is floral and perfume-y. Mouthfeel: Crisp, dry, light to medium bodied with spritzy moderate to high carbonation. 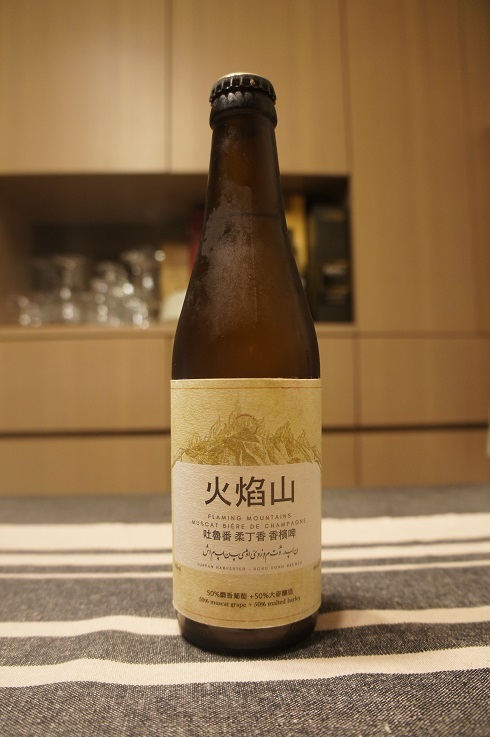 Overall: Nice aromas and taste which made it refreshing to drink.